Pressure seal bonnet is suggested for better closure in high pressure condition, while bolted bonnet is still available for customer's option. The pressure seal design incorporates a metal-to-metal seal that becomes tighter as the pressure increases. The initial preload deforms the taper on the soft iron gasket to mate with the taper on the bonnet. The thin knife-edge on the gasket is wedged tightly between the body and the bonnet. The shallow angle insures that the gasket is sealed tightly with only a small upward force on the bonnet. 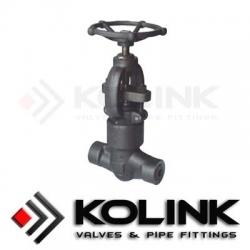 Once the initial seal is created, the body/bonnet joint will remain leak free regardless of thermal or pressure conditions in the valve.After the joint has been assembled, there is no further need to adjust bonnet cap screws.